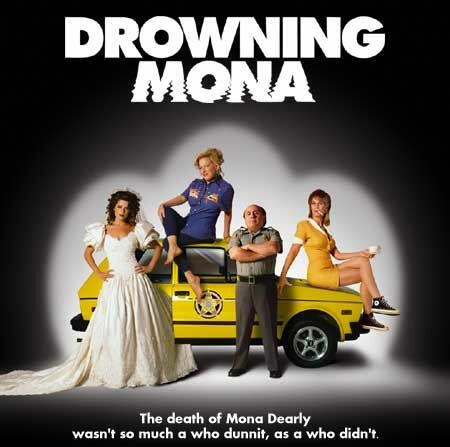 Drowning Mona continues a recent trend in screen comedy that accentuates the cynical--with frequently funny results. Movies such as Election and Drop Dead Gorgeous have mined this territory successfully while giving us casts of characters who generally fall into two categories--the dumb and the evil. Few (if any) positive role models exist in these movies, and that's part of the fun: when things go bad, an avalanche of wrong turns soon follows. Provided you can appreciate the sadistic glee these films take in exposing the all-too-obvious faults of their leading characters, these films can be fun to watch. While Drowning Mona is filled with characters who delight in wallowing in their own stupidity, screenwriter Peter Steinfeld and director Nick Gomez make sure the movie's world seems familiar yet foreign. Set in a town nestled on the banks of the Hudson River, upriver from New York City, Verplanck looks vaguely like many other Eastern U.S. small towns; however, Verplanck has its own bizarre atmosphere--as evidenced by the ubiquitous automobile of choice in town--the Yugo. Thanks to a test marketing effort by the Yugo Car Company, everyone in Verplanck was able to purchase a Yugo at a cut-rate price. Now, Yugos are thicker than cockroaches in Verplanck. Even the Police Department drives Yugos. By virtue of all the tiny compact cars, Verplanck becomes a very individualistic town. In contrast, the world of Drop Dead Gorgeous--a small, rural town in Minnesota--is an everytown that represents anywhere and everywhere. As a result, the cynicism in Drop Dead Gorgeous often becomes overwhelmingly grotesque and vicious. However, thanks to the profusion of Yugos, Drowning Mona feels like it takes place in a world of its own. And that has the effect of softening the cynicism and making it more palatable. Also in Drowning Mona's favor, at the heart of the movie, is a genuinely positive character, Verplanck Police Chief Wyatt Rash (Danny DeVito). He's possibly the only principled citizen in town. After Mona Dearly (Bette Milder) dies in the movie's opening moments when her Yugo plows through a guardrail and into the Hudson River far below, Wyatt begins investigating her death. He soon discovers that her death was no accident. Her brake lines had been cut. Someone wanted her dead. But who? Wyatt finds no shortage of suspects. Mona was vile tempered and hated by almost everyone. Bobby Calzone (Casey Affleck) quickly becomes one of the leading suspects. "She was the worst person I've ever known," says Bobby. He's engaged to Wyatt's daughter, Ellen (Neve Campbell). "We gotta celebrate!" says Ellen when her fiancé brings home the bad news of Mona's death. Rona (Jamie Lee Curtis), the waitress at the local café, is having an affair with Mona's weak-willed husband, Phil Dearly (William Fichtner), as well as with Mona's mean-spirited and dim-witted son, Jeff (Marcus Thomas). "You snooze, you lose," says Phil Dearly about Mona's death. "I think she had a personality disorder," says Jeff. No one's losing any sleep over Mona, but Wyatt has a job to do: "I've seen people more upset about losing money in a candy machine," he says. Mona Dearly dies early on, but her presence hangs over the movie. As the movie flashes back in time, we see her slug her husband in the head with a frying pan, smash the headlights of Bobby's truck with a golf club, and slap her son's head. She has a personality like a pit bull. Bette Milder tries a little too hard to be vicious. Her growls always sound artificial. But the rest of the characters are a delight to watch, particularly William Fichtner and Marcus Thomas as Mona's dysfunctional family. Drowning Mona always feels like a minor movie, but that's part of the fun. This isn't a typical Hollywood movie. It's filled with surprises. In one of the funniest developments, the movie plays back several versions (sort of like an absurdist Rashomon) of the scene where Jeff Dearly lost his hand. No one seems to know the real story, but everyone has a theory, which typically revolves around Jeff reaching for a bottle of beer (and instead finding an ax or a wood chipper or a chainsaw or etc.). Drowning Mona is fashioned like a poor white trash version of Murder on the Orient Express--except its characters aren't headed anywhere. They're sort of like a bunch of cats thrown together in a sack, and we get to see them rip pieces out of each other. The results definitely aren't pretty. But director Nick Gomez (whose career has mostly been limited to television shows such as The Sopranos and Homicide: Life on the Street) shows a remarkable ability for keeping the story's sadistic elements from overwhelming the movie.